Last night waves of Joy, high energy and incredible singing and dancing crashed through the Bridlington Spa, as strictly come dancing champion Joanne Clifton took to the stage with A1’s Ben Adams to co-star in the sensational musical of “Flashdance“! I have never seen the movie (and from what I hear it might not really be my thing) but I was no stranger to the 80’s classics “What a feeling”, “I love Rock & Roll” and “She’s a maniac” that shook up the theatre! The whole thing was full of energy, laughter, awesome 80’s gear, and spectacular dance moves. It was a musical performance that the entire cast and producers should be incredibly proud of. 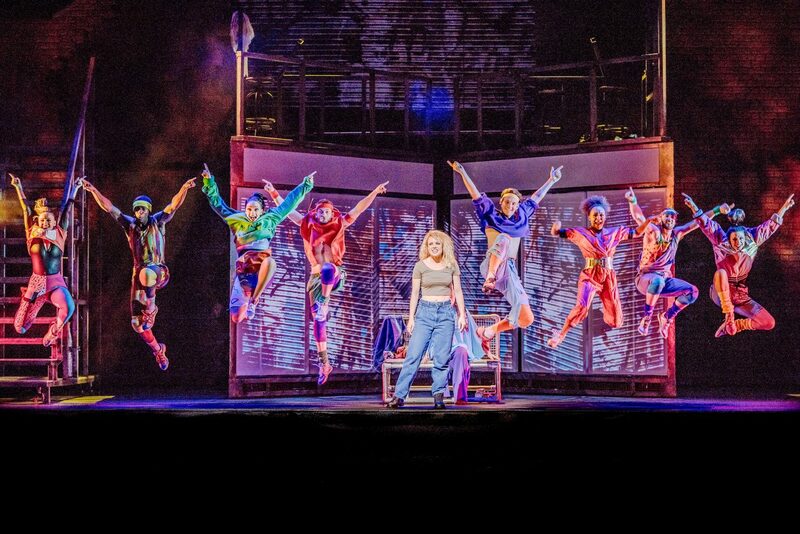 Flashdance tells of the inspiring story of 18 year old Alex – a welder by day, “Flashdancer” by night – who dreams of going to the prestigious Shipley Dance Academy and becoming a professional dancer. When a romance complicates her ambitions, she harnesses it to drive her dream. “Alex” – played by Joanne Clifton – was such a great character and had wonderful presence on stage. Her moves were impressive, and I spent half of it with my jaw dropped at how effortlessly she took to the floor! The chemistry between her and “Nick” was lovely to see, and it was exciting to see their relationship unfurl with the story. The whole cast were seriously amazing, and everything was executed with top class performances throughout. 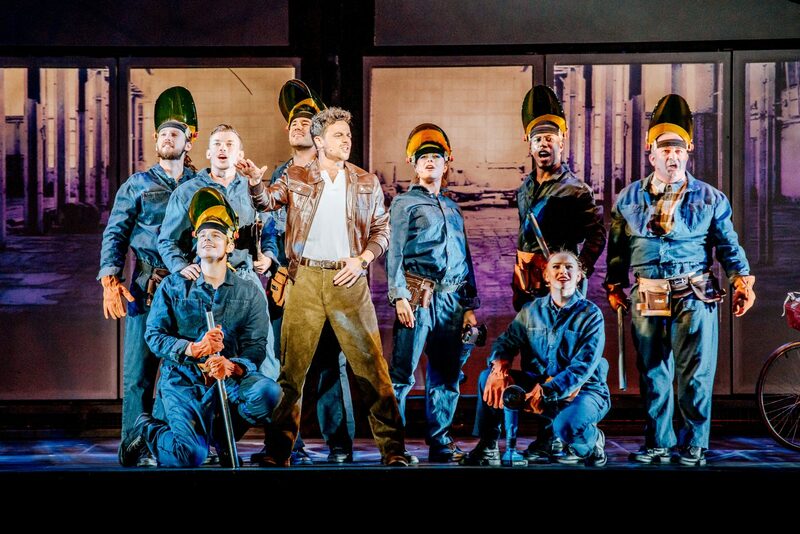 The singing was brilliant, and the set, whilst simple, was used effectively and I just loved how inventive it was. Whilst I hear the film is a little racy in places, this was not. The story line was presented in a tasteful and mostly clean way. First things first … the choreography in this musical is phenomenal! Like seriously amazing. And this is what truly stands out from start, right through to the grandest of all finales! I could not believe how those super stars could move, and what amazing shape they were all in. It was beautiful! The music, singing and dancing were all so brilliant and I loved that it oozed so much talent! Being a babe of the 80’s I personally loved the bright 80’s costumes, and style of the whole show. It has since ignited my love of the 80’s again, and all things retro, and today my Youtube playlist has reversed back 30 years! Overall it was just a whole lot of fun to watch. Of course the music and dance is what stands out here, but not previously knowing the storyline, I loved that too. Tales of friendship, romance, hard work and family – The sacrifices people make to fulfil their dreams, as well as the mistakes they fall in to in trying to make it big too! Overall it captures the love and support that fuels people to succeed, and the help of friends/family to get there. It was truly inspirational and I thoroughly enjoyed watching it unfurl! There wasn’t much I didn’t like about this musical, because on the whole I was blown away with how absolutely amazing it was throughout. But being LDS I would have to say that there was a little bit of language I found awkward, and of course it covered topics about drug use and dancing semi naked for money! If you are not a prude like me then these things will probably not be an issue at all for you, but as I know I have readers who are – I am putting it out there now! I wouldn’t take kids to see it, or even younger teens, because it really isn’t for them. But for a night out with the girls or ya mum, then grab it with both hands and get yourselves there! It is really good; full of energy and well loved 80’s classics, and produced in a very tasteful way too. Flashdance The musical was spectacular, with one of the best finale’s I have possibly ever seen. It was so much fun to be a spectator of, so with limited tickets, I would highly recommend you get yourself to the coast as soon as possible to catch a glimpse of this classic and memorable musical! *Thanks to Brid Spa for the invite to see this – all thoughts are my own!